Why let somebody else sell MY stuff? 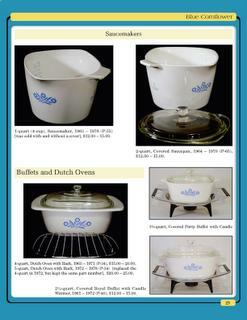 Corning Ware and Visions were the most versatile cookware that were ever made. Created of the durable Pyroceram material originally used on the nosecones of rockets, they were the only dishes that could be used in the oven, in the freezer, on the range top, or in the microwave. Now that the Pyroceram material is no longer being produced, a huge market has erupted for these beautiful and durable dishes. 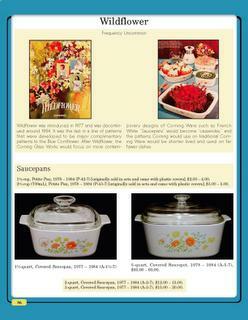 This book chronicles the 40+ years of Corning Ware and the 15 years of Visions. Compiled directly from information in the Corning Glass Works archives, this complete and unabridged guide covers the 60+ patterns, hundreds of shapes, and thousands of specific dishes of Corning Ware and Visions made from 1956 to 1998. The book includes hundreds of detailed pictures, as well as specific information about each piece, including the dates it was made, its rarity, its current value, and other interesting information. 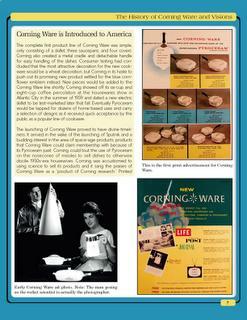 The guide also includes information on the history of Corning Ware and Visions, as well as on the Corning Glass Works, and how Corning Ware and Visions were discovered, manufactured, and sold to the public, including many historical photographs and advertisements. 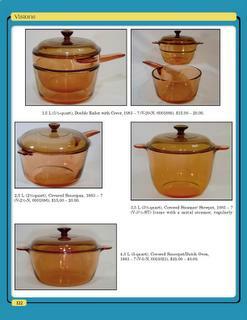 This book is essential for any kitchen or glassware collector, dealer, trader, or appraiser, or for anybody else who appreciates this beautiful and versatile cookware. 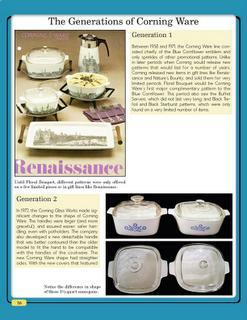 The Complete Guide to Corning Ware and Visions is now on sale. It is published by Collector Books, a division of Schroeder Publishing. $19.95, ISBN #: 1-57432-468-3. Visit Collector Books at collectorbooks.com or call 1-800-626-5420.
click images to see full-sized sample pages.